Introduction: The study intended to support the decision-making process regarding whether to save a compromised tooth by endodontic treatment with a subsequent postcore and crown or to extract such a tooth in favor of implant replacement. Therefore, the aim of this study is to explore differences between the two modalities of treatments in terms of clinical and radiographic outcomes and quality of life. 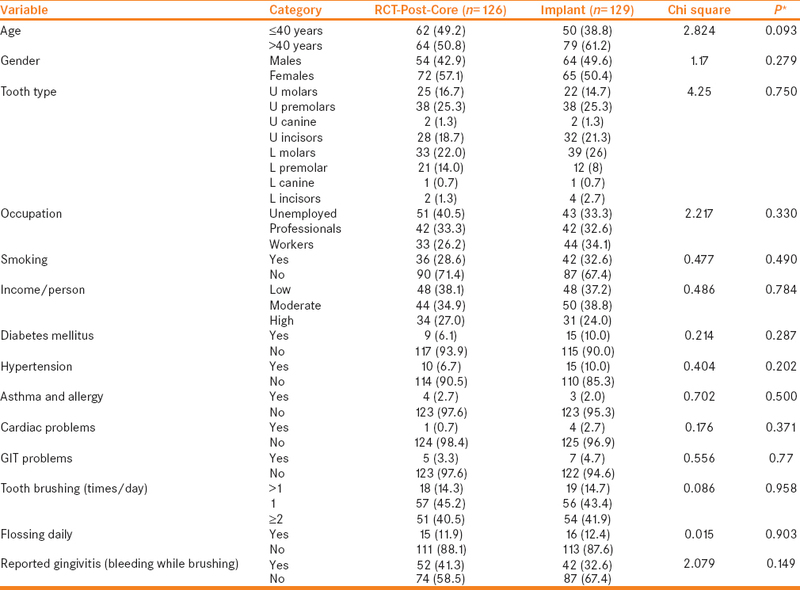 Materials and Methods: A randomly selected 126 patients with 150 root canal treatment (RCT) teeth compared with 150 single-tooth implants in 129 patients was conducted at Jordan University of Science and Technology in Jordan. Participants were clinically and radiographically examined after 1 year of treatment. Administered questionnaires were filled on patient interview consisting of patient's characteristics and oral health impact profile (OHIP) instrument. Data analysis included descriptive statistics, bivariate analysis using Mann–Whitney tests and Chi-square tests. Results: Treatment outcomes for RCT and implant groups were as follows, respectively: success (75.3% and 56.7%), satisfactory survival (8.7% and 24.7%), compromised survival (4% and 10%), and failure (12% and 8.7%). Improvement of the subject's OHIP items reveals a notable improvement (67%–100%) following RCT (mean improvement = 96.32) and implant (mean improvement = 89.04) treatment. Conclusion: RCT and implant achieved equivalent proportion of cases having a good prognosis. However, implant restoration was associated with more postoperative complications. Both treatments achieved a predictable improvement in patient's OHIP. In everyday practice, dentist faces a dilemma of assessing certain teeth with compromised situations. In terms of teeth that require root canal treatment (RCT) with compromised restorative cases, crowning with postfabrication may be inevitable. Recent advancement in dental implantology has brought an option for replacing compromised teeth by artificial implants. If abused, dental implant may constitute a threat to the conservative principle of tooth saving. Hence, the decision should be based on scientific evidence and should be directed toward patient's benefits, health, and welfare. The comparison between the outcomes of RCT with postcore restoration and single-tooth implant restorations was conducted. Dental students were found to prefer dental implants over RCT with postcore restoration in a survey among dental faculty and dental students. Therefore, more implant treatment might be recommended for patients in the future. The International Congress of Oral Implantologists (ICOI) had simplified and updated a health scale specific for assessment of implant treatment. This scale allowed the dentist to evaluate prognosis and future treatment needs of the existing implant on three main categories: success, survival, and failure. The success category described optimum conditions, while the survival conditions had two different subcategories which could be either satisfactory or compromised. Satisfactory survival described less than optimal conditions but yet did not necessitate clinical intervention, while compromised survival exhibited a slight to moderate peri-implantitis and compromised health status with neither pain nor mobility. Finally, the category of implant failure described an implant that had already been lost or planned to be removed. In providing complex treatment, evaluation of patients' related factors becomes of great value. Patient's quality of life should not be underestimated or ignored. Studies comparing and evaluating both treatment modalities: dental implant and RCT-postcore in terms of patients' perceptions of their quality of life still scarce. Dugas et al. were the first to assess the impact of endodontic disease and treatment on patient's life by selecting 17 items out of the 49 items included in the oral health impact profile (OHIP) originally designed by Slade and Spencer. Following RCT, Dugas et al. demonstrated improvement in all items of OHIP but to a varying degree. The greatest improvement was noticed among the subjects who had experienced a preoperative pain. Approximately 74% of patients who had experienced “painful aching” got relieved after RCT. In addition, approximately 73% of patients who could not fall asleep before receiving treatment were able to do so postoperatively. Studies directly compared RCT with postcore restorations, and implant restorations in term of quality of life are scarce. In another study, 97% of patients showed an improved quality of life by RCT with postcore. Gatten et al. attempted to identify patients' concerns and themes related to both treatments. Interestingly, the results showed that both treatments achieved similar overall OHIP scores. The most common concerns raised by participants in both groups were transient and had a short-term effect on their quality of life. The present study was conducted to help in the decision-making process regarding whether to save a compromised tooth by endodontic treatment with a subsequent postcore and crown or to extract such a tooth in favor of implant and crown replacement. Therefore, the aim of this study was to explore the differences between RCT with postcore restoration and implant restorations in terms of outcome, complications, radiographic and clinical parameters related to each treatment modality. In addition, it allows appreciating patient's perception of quality of life before and after treatment. The present study was a retrospective case–control study of two groups of patients: those who received RCT with subsequent post and core cast restorations (RCT with postcore group) or those who received implant restoration (implant group). The study was approved by the IRB Committee of Jordan University of Science and Technology (JUST) No. 185/2011. All enrolled individuals were informed about the objectives of the study and the protocol being used for examination. Only those who signed written consent forms were included in the current study. The sample included in this study was participating patients who attended the Dental Teaching Center (DTC) of JUST in Irbid, Jordan. The database of DTC clinic was reviewed to identify patients who have been served with RCT with postcore restoration as well as single-tooth implant and crown restorations. To be included in the study, a participant has to be 18 years or older. For the RCT with postcore restoration group, participant should have a history of RCT followed by a subsequent post and core and crown restorations. Each tooth with RCT with postcore restoration had to have an opposing natural tooth. Postcore treated teeth that were part of multi-unit restorations such as bridges were excluded from the study. For Implant group, participants should have received the final coronal restoration at least 1 year before the recall examination. Each implant should have an opposing natural tooth. Multi-unit restorations such as implant-retained bridges were excluded from the study. All participants were recalled for evaluation at least 1 year after the completion of RCT or implant restorations. The assessment tools in this study were clinical and radiographic examination and interviews to administer questionnaires at least 1 year after the completion of their restoration. Two calibrated examiners conducted all the clinical and radiographic examinations as well as interviews. Inter-examiner agreement using Kappa statistic was found to be 0.95 and 0.98 of the clinical and radiographic examinations, respectively. The examiners were calibrated on evaluating radiographic findings related to RCT and implants. Ten radiographs at the initial, middle, and final periods of the study were randomly selected and reevaluated by both examiners to ensure consistency of the examination along the whole study time. Radiographic examinations were conducted using size 2 intraoral periapical films with the proper aiming device in a paralleling technique to ensure reproducibility. The following radiographic assessment information were recorded for RCT with postcore group: (a) quality of obturation was assessed by recording length, density, and taperness of the root canal filling; (b) presence of bone loss, apical periodontitis, furcal lesions, condensing apical periodontitis, and root resorption; and (c) The “periapical index” (PAI) score of periapical health or disease. However, in the implant group, radiographic assessment focused on bone loss and radiolucency around implants using the criterion adopted from those of the ICOI at Pisa consensus conference. Clinical assessment includes retention of the RCT with postcore teeth in the mouth at the time of recall, absence of pain or tenderness on function, absence of mobility, and absence of exudate. For all implants, clinical evaluation in terms of mobility, absence of exudates, retention of implant in the mouth at the time of recall, and patient's perception of lack of pain or tenderness on mastication was recorded. The outcome measures that were used to assess each of RCT with postcore and dental implant restoration included: success, survival, and failure. The success category described a treatment associated with optimal clinical and radiographic conditions (e.g., PAI score = 1 or 2). The failure of any treatment represents a condition which necessitates to retreat or to reconsider other treatment options (e.g. PAI score = 5). Survival category included two subcategories which could be either satisfactory or compromised. Satisfactory survival subcategory described a treatment with less than ideal conditions but yet did not require any clinical intervention except observation (e.g., PAI score = 3), while compromised survival subcategory may necessitate intervening soon (e.g., PAI score = 4). The responses to the 17 OHIP items were collected through administered questionnaires during patients' interviews before and after each treatment modality. For example, the question “Have you found it difficult to fall asleep because of your teeth or mouth?” was assessed preoperatively by patients using five-responses as follows: never “coded 0,” hardly ever “coded 1,” occasionally “coded 2,” fairly often “coded 3,” and very often “coded 4.” Then, to reflect postoperative changes, all participants were asked to record their responses after receiving the restoration. Postoperative responses included three options: (a) the treatment improved the situation; (b) the treatment worsened the situation; and (c) no change was noticed. Data were entered and analyzed using the Statistical Package for Social Sciences software version 22.0 (IBM Inc., Chicago, IL, USA). Frequency distribution of participants' characteristics was generated for both RCT with postcore group and implant group. Postoperative restoration complications, clinical and radiographic assessment variables related to both restorations were calculated using frequency distributions, mean values, and standard deviations. Independent variables were tested against patients' quality of life using Mann–Whitney U-tests for continuous outcome variable and Chi-square for dichotomous variables. Participants who were found to fit the preliminary inclusion criteria for both groups were around 600 patients (total = 300 participants in each group). For the RCT with postcore restoration group, 170 patients were randomly selected from the 300 initially evaluated subjects. Of whom, 44 (26%) participants were excluded from the study for the following reasons: 22 participants did not have opposing natural teeth; nine participants reported that they had their restoration completed <1 year ago, whereas 13 patients had teeth served as abutments for fixed bridge. For the Implant group, 185 patients were recalled randomly for evaluation. Of whom, 56 (30%) individuals were excluded because of having missing natural opposing dentition (18 subjects); being part of multi-units bridge work (14 subjects), and were recalled earlier than the completion of 1 year at recall time (8 subjects). In 16 cases, radiographs at the time of implant insertion were not available for comparison and evaluation of bone loss, and hence they were excluded. The final sample consisted of 255 patients, 126 patients with 150 RCT with postcore treated teeth and 129 patients with 150 implants. The mean age of the individuals was 41 years for the RCT with postcore restoration group and 44.8 years for the implant group. Of the total 150 RCT with postcore treated cases, about 62% were maxillary teeth. Among those, premolars were the most numerous (41%). Similarly, almost the same proportions (63%) of implant cases were inserted in the upper jaw with 41% replacing premolar teeth. Meanwhile, RCT with postcore of mandibular molars comprised more than one half (58%) of the treated teeth in the lower jaw. As well, approximately (70%) of the implants placed in the lower jaw were placed in the molar region. [Table 1] presents frequency distributions of sociodemographic, smoking, medical conditions, oral hygiene practices, and reported oral health conditions among the RCT with postcore restoration group and the Implant restoration group. Male subjects accounted for about 43% to 50% of the participants. Approximately, one-third of patients were professionals, and about 70% were not smokers. There was no statistically significant difference between the two groups regarding sociodemographic, smoking, and medical conditions characteristics. [Table 2] presents treatment outcome among the RCT with postcore restoration and Implant restoration groups. The quality of root canal filling was assessed by length, density, and taperness of the filling. About 77% of the root canal fillings were within 0–2 mm from the apex, 71% were adequately condensed and 76% with adequate taperness. For implant cases, approximately 84% have optimal masticatory performance without any pain or tenderness around the fixture, 93% were found to be immobile, and 92% had radiographic bone loss <4 mm. An outcome scale as success, survival, or failure for both RCT with postcore restoration and implants restorations is presented in [Table 3]. The percentages of cases with ideal conditions were 75% and 57% of the RCT with postcore and implant restorations, respectively. However, the implant group had a higher proportion of cases (24.7%) classified as “satisfactory surviving” compared to their counterparts (8.7%) in the RCT with postcore group. Compromised results with questionable prognosis (i.e., failure and compromised survival) were almost equivalent among both groups. Respectively, 24 versus 28 cases in the RCT with postcore and Implant groups might need to be reevaluated for other restoration options soon. [Table 4] presents the distribution of OHIP scale items before and after treatment of either RCT with postcore or implant modalities. Concerning the RCT with postcore sample, most of the root canal treated teeth were associated with “physical pain” (i.e., OHIP3, OHIP4, and OHIP5) and interference with patients' ability to fall asleep (OHIP11). Psychologically, 82% of teeth requiring RCT with postcore were related to “self-conscious patients” (OHIP6) being aware of having a problem. Whereas, tension (OHIP7) and difficulty to relax (OHIP10) were respectively reported in 70% and 68% of the episodes with root canal diseases. “Being totally unable to function” (OHIP17) was the complaint in 70 episodes (47%) of teeth requiring RCT with postcore. Following teeth extraction in the implant group, psychological well-being was found to be the highest impact on patient's life. In this regard, approximately 89% of tooth loss episodes were associated with “self-conscious patients” (OHIP6) being aware of the problems that followed tooth extraction. As well, >60% of tooth loss episodes were associated with “tension” (OHIP7), “difficulty to get relaxed” (OHIP10), and “embarrassment” (OHIP13) before having implant restoration. 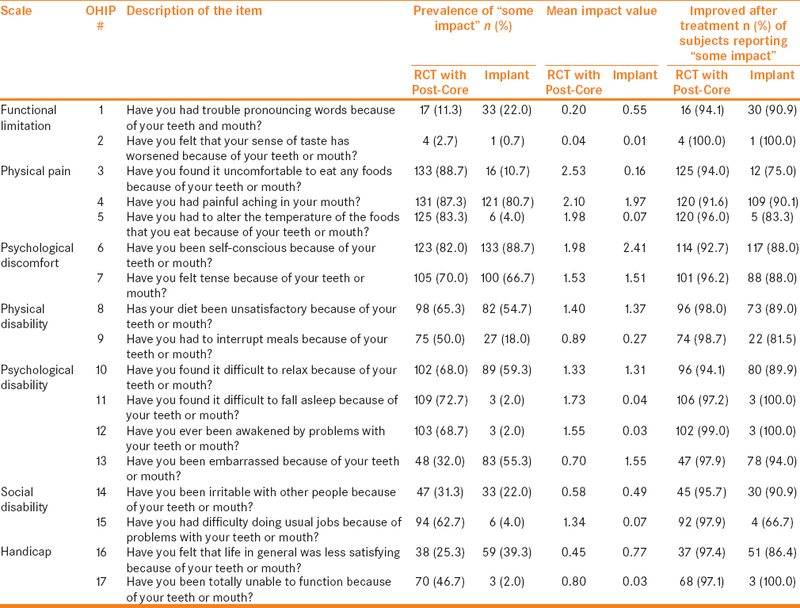 The proportion of episodes reporting to be “unsatisfied with their diets” (OHIP8) or “painful aching during eating” (OHIP4) on the side of tooth loss before having implant replacement was 55% and 81%, respectively. Improvement of the subjects' OHIP items reveals a notable improvement (67%–100%) for all tested items following RCT (mean improvement = 96.32) and implant (mean improvement = 89.04) treatment. Reviewing the literature, it is apparent that there is no agreement on which modality of treatment is superior to deliver, and hence, additional studies may add important information to the existing knowledge.,, On this premise, the present study was designed to focus on the differences between the two treatments modalities. The comparisons were expanded to include in addition to treatment outcomes, the quality of life after the treatment received. The fact that both treatments fundamentally different in many aspects frustrate direct clinical and radiographic comparison. In the absence of consistent and clear-cut clinical criteria, evaluation of patient's factors becomes of great value. Patient's perception of quality of life should not be underestimated or ignored especially while planning for complex treatment situations.,, On this ground, the current study took into consideration the second party (i.e., patients) to whom a restoration was served in addition to the clinical and radiographic parameters related to RCT and implant restoration. Based on the study by Orstavik, 84% of complications related to RCT took place during the 1st year after restoration, all cases belonging to the root canal group were evaluated for “outcome” not earlier than 1 year of having RCT. As well, a period of at least 1 year for implants serving as prosthetic abutments is needed to evaluate the likelihood of a successful outcome. Therefore, implementing the period of 1-year recall was adopted for the groups to ensure enough time to evaluate functionality and masticatory performance. Implant and RCT are fundamentally different. Therefore, the same clinical and radiographic criteria cannot be uniformly applied to evaluate both restorations. Reviewing the available literature, a great variability was noticed regarding the definition of success and failure. To make the comparison between both groups more objective, one assessment scale was used to evaluate both modalities. The scale includes three main categories: success, survival, and failure. The criteria of each category for implant treatment were quoted from the latest health scale specific for evaluation of endosteal implants by the ICOI. In an attempt to make the outcome comparison more objective, the same classification was applied for the outcome assessment of RCT. The ultimate goal of RCT is either to prevent or to heal an apical pathosis. Based on such rationale, all subjects belonging to the RCT group were evaluated based on the PAI score. Three-dimensional evaluation of periapical health using cone-beam computed tomography was not used in this study. Using conventional periapical images was more feasible and cost-effective methods for patients. The PAI is still an accurate and reproducible method of evaluation of apical periodontitis and that it has been used in clinical settings. In addition, PAI scores 1–4 are required to make objective comparisons with the apical health around the implants using of the ICOI. The final sample of the study included 255 patients, 126 patients with 150 root canal-treated teeth and 129 patients with 150 single-tooth implants. The sample was randomly selected from the list of patients of the second biggest city in Jordan, indicating more representativeness to the Jordanian population. Other studies assessing patient's quality of life of both restoration modalities recruited smaller sample size. In this regard, the study by Gatten et al. recruited only 17 patients with RCT and 20 patients with implant-supported prosthesis. Whereas, Dugas et al. evaluated 119 patients with a total number of 238 root canal-treated teeth. The mean age of the study population was within the middle age (about 42 years) which in turn decreases the impact of “periodontal status” on participant's evaluation of the treatment received. Statistical analyses of the sociodemographic characteristics demonstrated that individuals in both groups were suitably matched in respect to age, gender, occupation, smoking profile, and medical history. As well, differences among both groups in regard to oral hygiene practices did not reach a significant value. Matching between both groups was targeted to minimize the confounding effect of these variables. The outcome criteria used to evaluate RCT and implant indicated no difference in the proportion of cases with good prognosis and with compromised situations. Our observations were consistent with those of other previous studies., The results of the current study revealed that tooth loss and endodontic disease negatively impact patients' quality of life. In agreement with Dugas et al., the most prevalent negative impacts of endodontic disease among the root canal group were found to be within the items of “physical pain” subscale including having painful aching, eating uncomfortably, and altering food temperature. This means that the majority of RCT with postcore treatment were sought for the relief of preexisting pain or prevention of potential pain. Whereas, the “psychological discomfort” subscale, including being self-conscious and tense, was found to be the most affected following tooth loss. And, therefore, it could be the primary concern for those seeking for implant restoration. Our results clearly demonstrated that implant and RCT improved quality of life for all 17 investigated OHIP items. However, improvement scores were found to be higher among root canal subjects compared to that reported by implant group which reflects that RCT achieved higher improvements in patients' quality of life. In this regard, the comparison between both modalities should be made carefully, because the “17” items of the OHIP are biased toward RCT. Obviously, three items in the OHIP used including altering food temperature, difficulty to fall asleep, and being awakened are rarely experienced by those seeking for implant restoration following tooth loss. When analyzing the impact of other factors on the magnitude of patients' perceived improvements, it was found that age, smoking, and diabetes mellitus were not relevant to both groups. Female subjects in both groups showed higher improvement scores than that reported by male participants (P > 0.05). Female patients might be more explicit about the description of the disappearance of their pain and sufferings after treatment than males. This fact is worth further investigations. RCT and implant achieved equivalent proportion of cases having a good prognosis. However, implant restoration was associated with more postoperative complications. Both treatments achieved a predictable improvement in patient's OHIP. Based on these findings, as long as teeth can be treated successfully with RCT and subsequent crowns, there might be no sound clinical justification to replace them with artificial ones. This is study was partially supported by grant No. 185/2011 from the Deanship of Research of Jordan University of Science and Technology, Jordan. Dawson AS, Cardaci SC. Endodontics versus implantology: To extirpate or integrate? Aust Endod J 2006;32:57-63. Di Fiore PM, Tam L, Thai HT, Hittelman E, Norman RG. Retention of teeth versus extraction and implant placement: Treatment preferences of dental faculty and dental students. J Dent Educ 2008;72:352-8. Salehrabi R, Rotstein I. Endodontic treatment outcomes in a large patient population in the USA: An epidemiological study. J Endod 2004;30:846-50. Iqbal MK, Kim S. For teeth requiring endodontic treatment, what are the differences in outcomes of restored endodontically treated teeth compared to implant-supported restorations? Int J Oral Maxillofac Implants 2007;Suppl 22:96-116. White SN, Miklus VG, Potter KS, Cho J, Ngan AY. Endodontics and implants, a catalog of therapeutic contrasts. J Evid Based Dent Pract 2006;6:101-9. Zitzmann NU, Krastl G, Hecker H, Walter C, Weiger R. Endodontics or implants? A review of decisive criteria and guidelines for single tooth restorations and full arch reconstructions. Int Endod J 2009;42:757-74. Orstavik D, Pitt Ford TR, editors. Apical periodontitis. Microbial infection and host responses. In: Essential Endodontology: Prevention and Treatment of Apical Periodontitis. Oxford: Blackwell Science; 1998. p. 1-7. Orstavik D, Kerekes K, Eriksen HM. The periapical index: A scoring system for radiographic assessment of apical periodontitis. Endod Dent Traumatol 1986;2:20-34. Doyle SL, Hodges JS, Pesun IJ, Law AS, Bowles WR. Retrospective cross sectional comparison of initial nonsurgical endodontic treatment and single-tooth implants. J Endod 2006;32:822-7. Farzaneh M, Abitbol S, Lawrence HP, Friedman S; Toronto Study. Treatment outcome in endodontics-the Toronto study. Phase II: Initial treatment. J Endod 2004;30:302-9.